Waiting or Blocked or Sleeping State. A thread enters a new state when an object of Thread class is created but the start() method hasn't been called on it yet. In new state, a thread is not considered alive as it's not a thread of execution. Once the start() method is called on the thread, it leaves the new state and enters the next state but once it leaves new state, it's impossible for it to return back to new state in its lifetime. A thread enters a runnable state when the start() method has been called on it. It means, that a thread is eligible to run, but it's not yet running, as the thread scheduler hasn't selected it to run. At one point of time, there could be multiple thread in a runnable state, it's always the choice of thread scheduler to decide on which thread to move to the next state from runnable state. A thread in runnable state is considered to be alive. 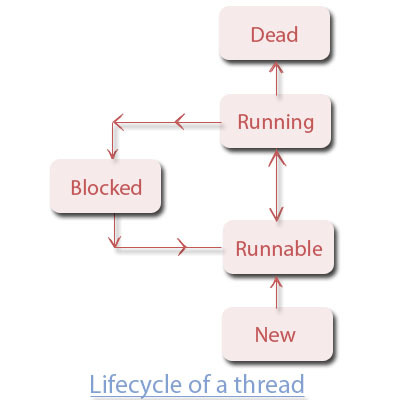 A thread can return to a runnable state after coming back from a sleeping, waiting/blocked or running state. When a thread has called wait() method on itself and it is waiting for the other thread to notify it or wake it up. When a thread code has called sleep() method on a thread, asking it to sleep for a duration. When a thread is waiting for an Input/Output resource to be free. When a thread finds itself in any of the above mentioned three states, such events pushes the thread into a blocking/waiting or sleeping mode and the thread is no longer eligible to run. In any of these states, the thread is still considered to be alive. When thread gets out of waiting, blocking or sleeping state, it re-enters into runnable state. This is the last state in a thread's lifetime. A thread enters the dead state after it has successfully completed executing the run() method. At this situation, it is considered to be not alive and hence if you try to call start() method on a dead thread, it raises IllegalThreadStateException(which we will read about in an upcoming article).